In a mixing bowl, combine the tuna, veggies, celery, green onions, garlic powder, mayo, salt and pepper. Mix until it's well combined. Lay the wrappers out, so they resemble a diamond shape. Put 2 heaping tablespoons of the mixture into the center of each wrapper. seal all edges with water using your finger or a brush. Fold the outside edges towards the enter. Then, fold the edge closest to you into the center and roll it into a log shape. Place about 2 inches of oil into the bottom of a wok or frying pan and heat it to about 375 degrees F or 190 C.
Fry the rolls, in batches, for 3 to 4 minutes on each side or until they are golden brown. Alliteratively, you can bake it at 400 F for 12 minutes or so. 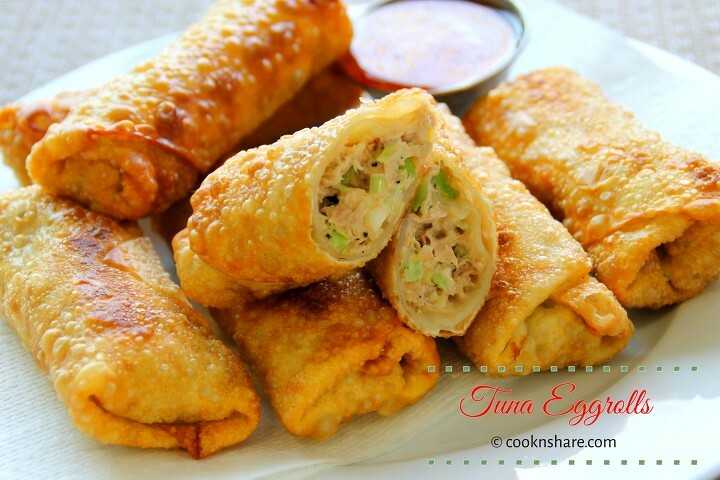 Serve with your favorite sauce and enjoy your tuna egg rolls.